After barely managing to escape the clutches of the Rex Luthor-led “Gang” – basically a collection of alien kids obsessed with (and dressed as) some of Earth’s most infamous villains – our diminutive heroes have found themselves crash-landed on a strange planet and trapped in the “House of Secret Mysteries”. Oh, and at the conclusion of the previous issues, they found themselves coming face-to-face with grown-up versions of themselves! Writer Peter J Tomasi is clearly having an absolute blast with this series, throwing out wild concepts and quirky ideas at a dizzying pace. This latest wrinkle is a solid enough idea in itself, but time travel/alternate future stories often struggle as a result of the inherent confusion and “hang on… what?” nature of that kind of storytelling. 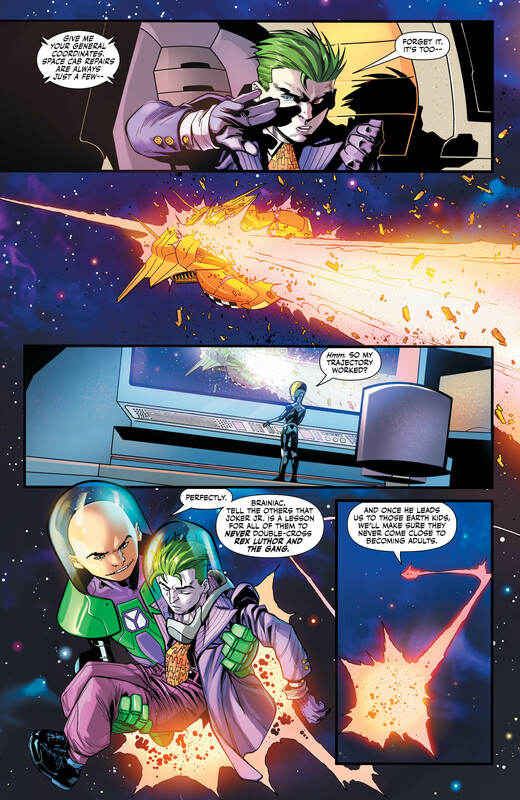 There’s a little of that here, and while things are eventually resolved and well explained near the end of the issue, it does render a lot of the early portion of the book a little confusing in terms of figuring out what our heroes are actually dealing with. That said, it’s a heck of a lot of fun to see Jon and Damian interacting with their older selves, particularly when they take a step outside the “House” and get a glimpse of where their adult lives have ended up. 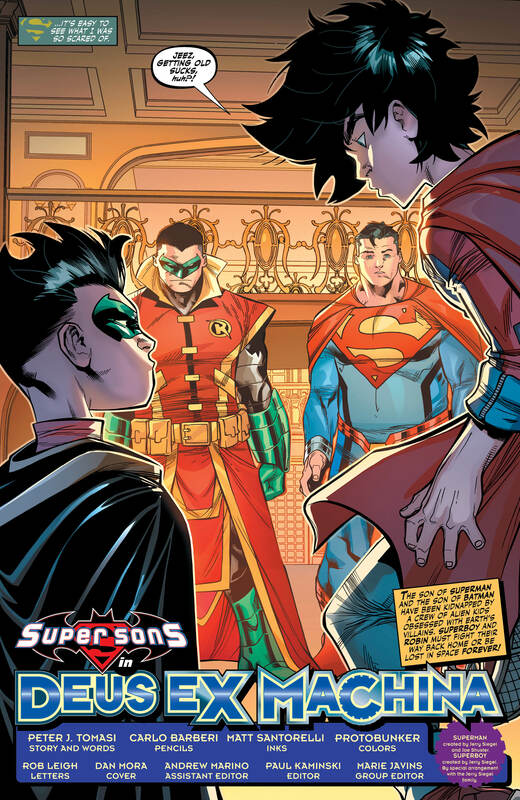 Tomasi opting to have the older versions of the Super Sons narrating the issue also adds an interesting and fresh perspective on the events as they’re unfolding, as well as giving a little insight into Jon and Damian’s adult relationship. We also get a little introspection from each of the adults, which adds an interesting slant on the way the pair view themselves and their lives. For me, the resolution to the situation feels a little on-the-nose, even if Tomasi’s motivations are definitely pure. The sentiment is great (no spoilers here), but could perhaps have been delivered a little more gracefully than simply having one of the supporting characters blurting it out. It’s a fun, uplifting moment that doesn’t necessarily make a ton of sense, but is definitely likely get the warm fuzzies going on the part of the reader. On the visual side of things, the artwork is definitely in keeping with the series so far, with Carlos Barberi and Matt Santorelli delivering a lively aesthetic and some energetic character designs. The layouts are fluid and dynamic, several of the weirder moments are delivered with some real flair, and there’s a general sense of fun and light-heartedness throughout without things ever having to resort to becoming too ‘cartoony.’ Protobunker deserves a massive amount of the credit as always for their work on the colours, making this an incredibly vibrant and eye-catching series and bringing Jon and Damian’s outfits (both sets of them) to life in striking fashion. 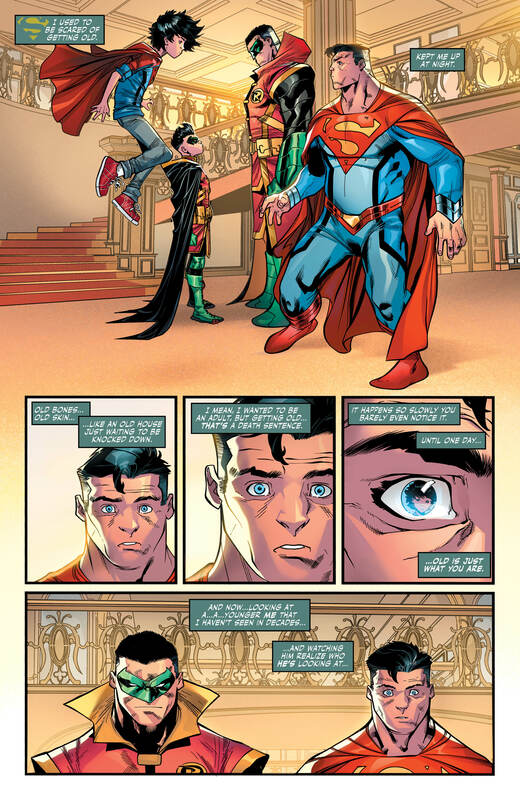 As with any other issue of Super Sons, it’s all built around the impressive chemistry Tomasi is able to generate between Jon and Damian, and while there are some entertaining interactions here, they do seem to take a bit of a back seat at times to the slightly muddled ‘future selves’ situation they find themselves facing. 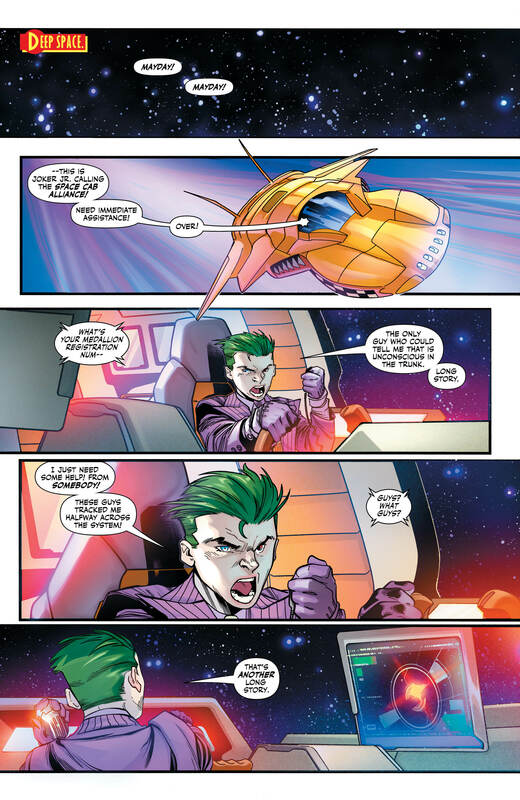 It’s a fun issue, but the fact that the threat is introduced and resolved in such rapid fashion makes it all feel a little slight, in spite of some admittedly fun moments along the way. 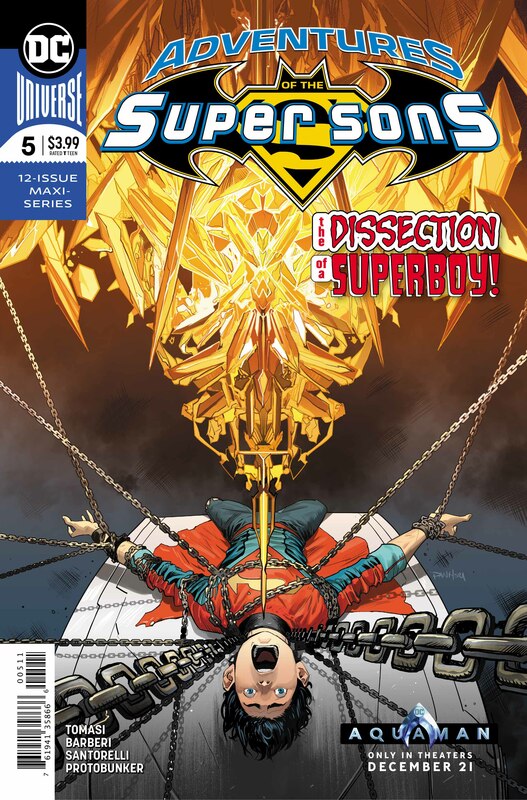 At the end of the day, if you’re a fan of the characters then you’ll definitely enjoy what Tomasi and co. serve up here, and if you’re looking for a funny, heartfelt DC series that doesn’t insult your intelligence, then Super Sons comes highly recommended.